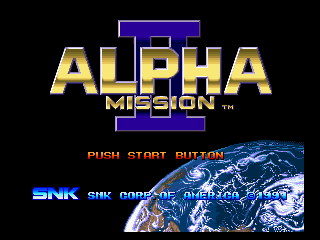 Alpha Mission II (also known as ASO II: Last Guardian, its Japanese title) is a vertically scrolling full screen shoot 'em up released by SNK Corporation in 1991 for the Neo Geo arcade and home systems. It was later released for the Neo Geo CD in 1994 and for the PlayStation Portable in 2010. The player controls a fighter spacecraft (Armored Scrum Object) and can shoot enemies in the air, bomb enemies on the ground, collect power-ups, and defeat bosses to advance levels.